Even though it is somewhat shocking when we encounter someone who blatantly rejects reason and evidence, in favor of a subjective belief, fundamentalist Christianity does much to foster this mentality. The John 20:29 quote above, has Jesus placing a higher value on those who believe without evidence, than those who are able to verify by sensory evidence. Let’s state plainly what Jesus was saying: “To believe based on what you can personally verify is ok, but if you make a leap of faith and believe based on hearsay, then you are truly blessed.” This is some of the worst advice that one could give, seeing as how all sorts of nonsense from bogus cancer cures, to Nigerian email scams, rely on people’s unquestioning acceptance of claims without proof. Essentially, Jesus is placing a spiritual premium on being gullible and naïve. Credulous acceptance of any and all claims is a virtue. Mindlessness is next to godliness. P. T. Barnum’s sucker-born-ever-minute had just been granted sainthood. In the New Testament, the writers of the Gospels shrewdly muddy the waters by claiming that people refused to believe despite witnessing Jesus performing miracles. This of course, goes hand in hand with the Christian refrain that atheists know God exists, but simply choose to deny this. Why provide evidence if some people aren’t going to believe anyway? In Luke 16, Jesus tells the story of a rich man who ends up in the torments of Hell and begs Abraham to send someone back from the dead to warn his brothers so they don’t end up there too. Abraham replies that the man’s brothers have the writings of Moses and the prophets, and that should be enough. The rich man, recognizing the value of evidence in persuading people, insists that if someone is raised from the dead that will make his brothers take notice. Abraham replies that even then, the brothers would still not be swayed. In other words, why give them evidence, if they won’t believe anyway. Of course Abraham’s assertion that a book is all the evidence needed is ridiculous, but this is how it works in the fantasyland of Christianity. Christians have a Bible filled with miraculous, unprovable claims and they believe those claims, simply because they are found between the covers of that book. And, let us not forget the unnamed author of Hebrews who devotes the whole of chapter 11 to the praise of mindless belief. Who needs evidence when belief itself becomes the proof? Get that folks? All these people died (some of them in horrible ways) without ever seeing the result of what their faith promised them. The golden carrot on the stick dangled just on the other side of death, as it still does. And, since Father Abraham doesn’t like the idea of sending anyone back from the dead to verify the state of the afterlife for us, you just have to devote your life to your religion and its invisible god, in the hope – or should I say in ‘faith’ that there will be a life after death, and that heavenly carrot will be waiting for you. 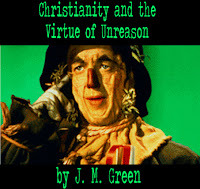 In the Christian faith, mindlessness is next to godliness. To trust reason and require evidence is to imperil your very soul. Blind belief becomes a feat of spiritual strength to be admired and emulated. Strap a Bible to your head and send your brain on a suicide mission for Jesus; become a mind-martyr for the cause. I have both seen and experienced how Christianity encourages people not to ask too many questions and not think too deeply. There are certain invisible boundaries and if you stray beyond them, you will reap the negative social consequences. Faith provides pseudo-certainty and doubt is a disease. Voice your doubts aloud and you soon will become a leper to be avoided in the city of faith. The fundamentalist believer is happy to make use of reason, and science selectively in service of promoting their religion, but the moment these tools reveal flaws in their belief system, they slash the ties and float free, soaring on the wings of faith, unencumbered by rationality. Critical thinking does not always provide easy answers, let alone soothing ones. For the believer, the retreat into dogmatic belief is like a warm, soft security blanket they can wrap themselves in when facts and reason provide cold comfort. Doubt is disparaged and demonized by religion, but doubt is actually a valuable tool, guarding against self-deception and delusion. Recently, I was discussing with a family member, the tendency of the Bible’s god to kill children for their parents’ ‘sin’, “Do you think it is ever right to kill a child because you are angry at their parents?” I asked. “Well, uh, ummm… God knows what is best, and I trust him,” was the response. To me, that was very telling. Fundamentalist dogma has decreed what truth is and the mind must be subjugated to this dogma. Alternative evidence and answers must be rejected, using the ‘shield of faith.’ You see, faith is the immune system that protects the God virus from potential threats which might cause it to weaken and die. 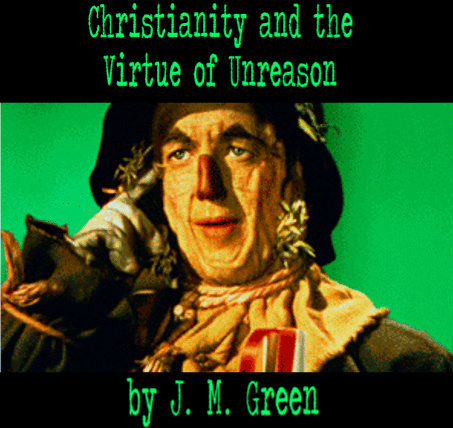 Despite all the technological and scientific advances in our world, it would seem that the Queen of Unreason is still the tyrant who rules supreme in the Wonderland of religion.